We’ve been keeping local painter decorators and DIYers in paint and decorating supplies for more than 20 years now, the last 10 or so as part of the Brewers family with all the benefits that brings. You’ll find a large choice of wallpapers in-store, as well as a variety of paint brands and a wide selection of decorating sundries. 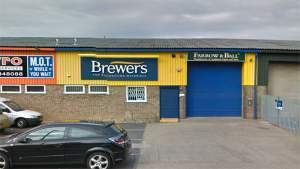 Our Peterborough Brewers Decorator Centre is right at the end of Brassey Close, a couple of minutes’ drive from the A15 Bourges Boulevard via Lincoln Road. Look out for Graham Young Pharmacy and take the turning on the opposite side of the road. We have customer car parking right outside the door. Travelling up Lincoln Road with the railway track on your left, turn left onto Brassey Close. Follow Brassey Close to the end and around to the left, you will find the store on your left.